FILE - A South Sudan army soldier stands next to a machine gun mounted on a truck in Malakal town, some 500 km (312 miles) northeast of the capital, Juba, Dec. 30, 2013. South Sudan has been found to be among the countries cutting back on military spending due to low oil prices. African military expenditures have finally slowed down after more than a decade of steady increases, according to a new report on global defense spending. The main reason, the report found, is a drop in oil prices. “The sharp decreases in oil prices has affected quite a number of African countries, namely South Sudan and Angola. This has kind of driven almost the entire regional trend,” said Nan Tian, a researcher at the Stockholm International Peace Research Institute’s (SIPRI) Arms and Military Expenditure Program, the organization that authored the report. The SIPRI report found military spending in Africa in 2016 was down by 1.3 percent from the previous year and totaled about $37.9 billion. Despite the drop, Africa’s military spending remains 48 percent higher than it was a decade ago. “A few of the top spenders within these regions are generally oil economies, so the low oil prices have meant sharp cutbacks in government financing and that includes military spending,” he said. Some of Africa’s biggest spenders in recent years have included oil-rich Angola, which has sought to modernize its air force and navy, and Algeria which has tried to preserve its stability amid the collapse of Libya and the rise of extremism in North Africa. Both of those countries have slowed spending recently, Tian said. 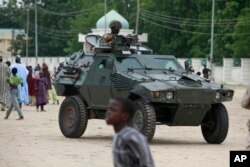 FILE - Nigerian soldiers ride on the armored vehicle in Maiduguri, Nigeria, Aug. 8, 2013. Nigeria is among the few African countries that have increased their military budgets in recent years. Tian said that perhaps the most important question to ask, is whether military spending in Africa is at appropriate levels. Ten African countries have military expenditures greater than 3 percent of their GDP. The highest are the Republic of the Congo where military expenditures totaled 7 percent of GDP in 2016, and Algeria where military spending totaled 6.7 percent of GDP. Globally, military spending is 2.2 percent of GDP or about $227 per person. Not all African countries saw a decline in military spending. According to the report, Botswana’s military spending grew by 40 percent, or about $152 million. Botswana is regularly noted for having a long record of peace and good governance, and is undergoing a military modernization program. Nigeria increased its military spending by 1.2 percent to $1.7 billion as it strives to defeat the radical Islamist group Boko Haram. Similarly, Kenya and Mali increased military spending due to extremist threats in their regions.